Villa Tricoli is a cosy Bed and Breakfast near Saint-Tropez, on the French Riviera. This family-run B&B offers a peaceful and verdant setting for you and your family, allowing for a truly enjoyable stay on the Mediterranean coast. Discover the famous bay of Saint-Tropez without spending a fortune! The owners are always present on-site, available for any question you may have regarding the area and free-time activities. Villa Tricoli boasts beautiful gardens, which provide both shady corners and sunny terraces. 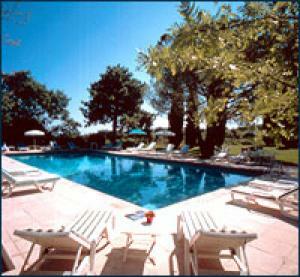 Guests may also take advantage of a large outside swimming pool. Anyone wishing to stay fit should definitely go for a walk on one of the numerous hiking trails throughout the beautiful surrounding forests. There are also extensive water sports facilities near the B&B, as well as 5 golf courses, horse riding, tennis courts, etc. Beautiful coastal towns like Saint-Raphaël, Sainte-Maxime, Cannes and Nice can be visited on a day trip.